Why do Gravity Waves Matter? The first recording of gravity waves by the physicists at the Laser Interferometer Gravitational-Wave Observatory (LIGO), using a pair of gigantic instruments in Hanford, Washington, and Livingston, Louisiana has been hailed as a major scientific breakthrough. 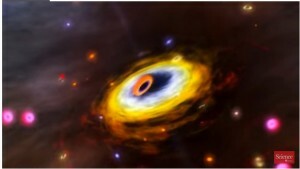 The result of two massive black holes drawing together about 1.3 billion years ago, when they finally merged sent a ripple through the universe in the fabric of space and time called gravitational waves. Five months ago, they washed past Earth. And, for the first time, physicists detected the waves, fulfilling a forty-year quest to demonstrate their existence. Their discovery marks a triumph for the 1000 physicists with the Laser Interferometer Gravitational-Wave Observatory (LIGO), a pair of gigantic instruments in Hanford, Washington, and Livingston, Louisiana who made the discovery. First there is the question of “proof.” Did the LIGO experiment prove the existence of gravity waves? Science never proves anything to be true, it simply demonstrates a theory or model of our universe seems to work. If our theories and models agree with real data, it demonstrates we probably on the right track to explaining how and why things happen, but it doesn’t necessarily prove the model is true. Likewise, if you find data that doesn’t agree with your model then it doesn’t necessarily prove that the model is wrong, but tends to suggest there is a problem with it. So if LIGO didn’t prove the existence of gravitational waves, why is it so important? The project was the first to collect evidence to support the gravitational wave model. Well, except that Russell A. Hulse and Joseph H. Taylor, Jr received the Nobel Prize in physics for their discovery of a binary pulsar with a changing orbital period in 1993. According to Einstein’s theory of general relativity, these pulsars should radiate gravitational waves and decrease their orbital period in the exact same manner as detected by Hulse and Taylor. So, technically they were the first to give convincing evidence of gravitational waves. However, the advanced LIGO enables us to collect more data on this phenomena to substantiate our theory. Without the Advanced LIGO, you would need a gravitational event (like colliding neutron stars) much closer to Earth, and it seems these events are fairly rare, so we might have to wait a long time for that to happen. By increasing the observational distance we can measure these phenomena, LIGO has given us a much greater chance of detecting future events. Generally, what this all means is, that a century of scientific innovation, testing, questioning and hard work we have finally started to tap into and explore the deepest register of physical reality, a century after Einstein imagined it. This, is very exciting stuff, and and understanding the nature of gravity is a massively important research area for all of us. Not because it will help us build anti-gravity machines or warp drives but because it can help us understand our world better. The expansion of our knowledge is fundamental to us making new technologies, and often we can’t even conceive what these will be when they are first discovered (e.g. James Clerk Maxwell’s work on electromagenetic waves in 1865 was thought to be of mainly academic value when initially reported)! This is also a great example of how science moves in small but important steps in helping us better understand the universe. To my mind, it also illustrates another important aspect of science vs pseudoscience. The scientific process rarely results in simple explanatory solutions to complex problems, but is an evolutionary (and occasionally revolutionary) process involving teams of researchers leading to progress. Pseudoscience on the other hand, usually involves simple explanations, shortcuts to knowledge acquisition through claims of massive intuitive leaps in knowledge, and proponents with celebrity/guru status, and that tends to do just the opposite.